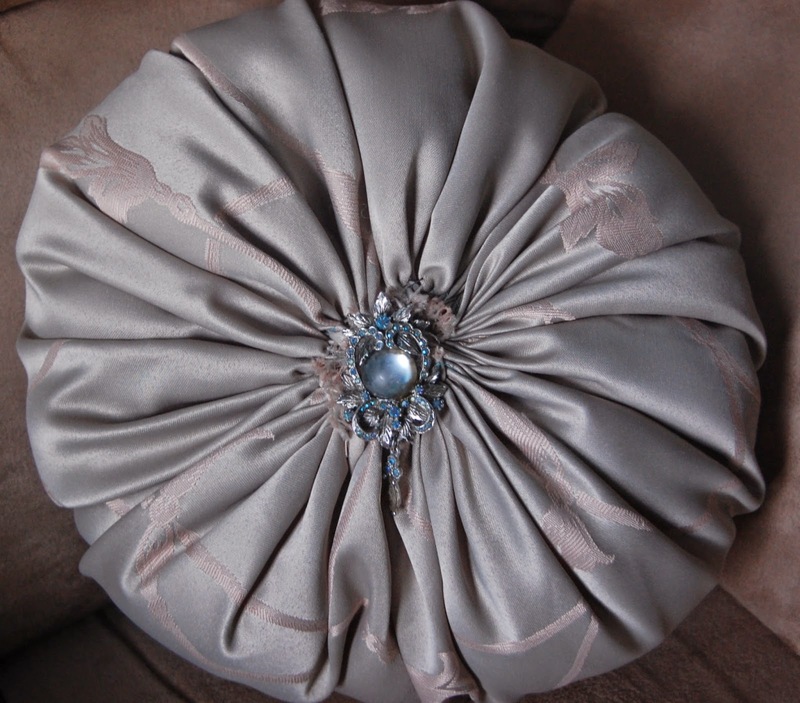 So here's my take on the gathered cushion I spotted last week at a posh homewares store. Mine was based on the same method you'd use to make a Suffolk Puff or as some of us know them...a Yo-Yo puff. There are many tutorials online for making those. Google is your friend there. So I just made a gigantic Suffolk Puff. That's all that red cushion looked like to me. I used that lovely soft green-grey damask, as I had a huge remnant of it in my fabric stash. I think I paid about $4 for it, and it's yielded three lovely gathered ball cushions, thankyou very much. I used my daughters Hula Hoop as a guide for cutting, but again, there are trillions of 'how to cut a circle' methods online. Bear in mind that you need the circle to be at least three times the size of your desired completed cushion. This also means you need as much width in your fabric as possible. I machine stitched all the way around the edge of the circle, and then ever so carefully and gently, pulled on the thread to gather it, regularly coaxing the gathers along the line, so they were even. In hindsight, hand sewing with embroidery thread would have possibly been easier, but I'm yet to test that method. Once I had the gathers about right, but still had a wide enough opening, I filled my cushion with Hobbyfill to the extent of puffiness desired. As I won't be sitting or leaning on my cushion, but rather using it for decorating purposes, I didn't go overboard, but I still used about a quarter of a bag of Hobbyfill for mine. Then, going gently again, so the threads didn't break, I coaxed my circle edge closer into the middle, to form the ball. Once I had it about as small as it could go (like a Suffolk Puff remember), I tucked the edges in and stitched the opening closed. I then pinned a vintage brooch to the centre, and voila! I think I like my cushion better to be honest. It certainly suits my décor more than red velvet would have. I love that the damask has a sumptuous sheen, and the vintage brooch really adds to the Victoriana feel. I have two pastel pink velvet ones on the go for my daughter now. I'll post a photo of those when done. They look completely different to my grey-green ones, but just as lovely. In preference to vintage brooches, I've used proper rhinestone buttons for hers. These added to the cost, but again, as I was using remnants, my cushions still aren't nearly as expensive. All up, I've made five gathered ball cushions, for $54. Each one has taken me no more than an hour to complete. Probably more like around 40 minutes. The red one, had I succumbed to temptation, would have set me back $59. It turned out really well, Mimi. 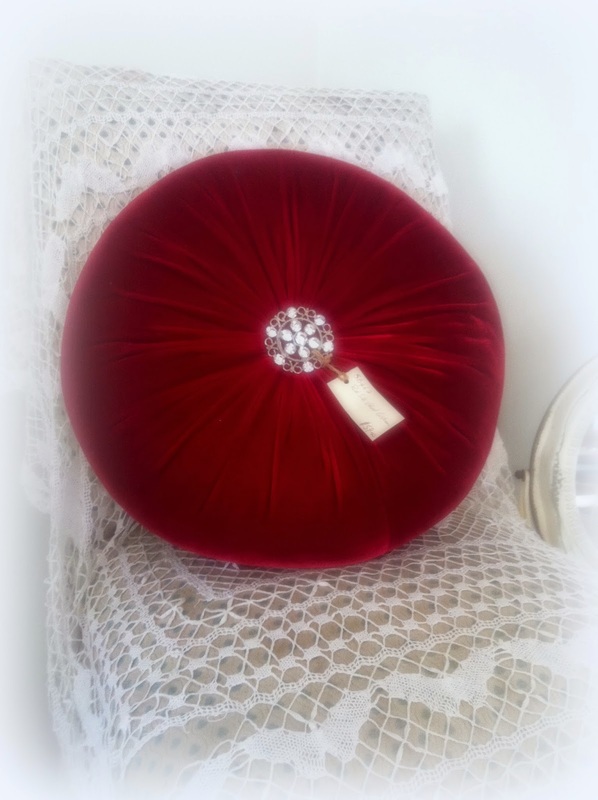 Very pretty and much cheaper than buying the red cushion. Thankyou Nanna Chel. I agree. Hesitation is good sometimes. I nearly bought that red one, but the 'redness' actually stopped me as I don't have any anywhere else. At least not that shade! On my screen, your beautiful new pillow is a taupe color, so I wish I could see it as the lovely green you've described (my favorite color, any shade!). Your version is a dream! And the bling! Oo, baby! Hello Kelley. I can imagine it would display as 'taupe'. It is in fact a gorgeous soft, muted sage. Just beautiful. And life is not complete without a bit-o-bling! I love your pillow you made. It's so pretty and you saved making it yourself. Thanks so much for your kindness I appreciate it. Have a nice weekend. Your cushion is lovely Mimi. I bet you feel proud of yourself for all the savings you've made. Well done. Mimi what a wonderful gift idea and beautiful cushion. Have never made a suffolk puff in my life but am sorely tempted by this. How lovely! You did a great job and I love that the cost of 5 is still less than the cost of 1 retail shop price. Hello, What a beautiful idea, and it would make a very chic gift! I may just try these myself! Thank you for sharing, I also have been looking at the smaller size but a pillow is so more useful and adds a touch to a chair! Hello. This is such a lovely cushion you have made. I love the color of the fabric you used. It was fun to see this design of cushion since I made one like this years and years ago. It's beautiful. Beautiful pillow! Thank you for joining HSH! I love it!! I like yours best!